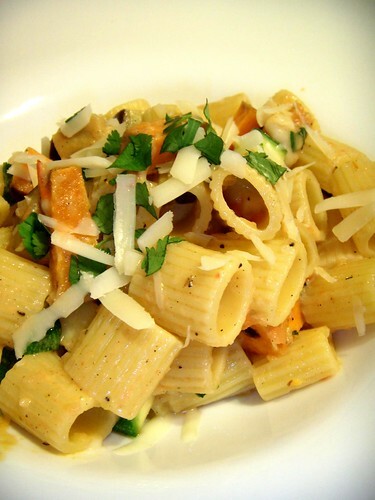 grilled vegetable mezzi rigatoni in a parsley and shallot cream sauce, originally uploaded by aarn! +12th February, 2009+. and the sweet potato was soft on the inside, the vegetables were pulled from the grill and cut into cubes roughly the same size as the pasta. minutes on medium heat, then pureed in the food processor, returned to heat in the sauce pan, added salt, pepper, and fresh chopped parsley. grilled vegetables, tossing the food in between each addition with tongs. served in some warm pasta bowls and topped with shredded parmesan and a little fresh parsley.